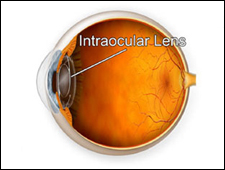 A cataract is the clouding or loss of transparency of the lens inside the eye. They can grow slowly or develop rapidly. Cataracts will eventually happen to everyone. They commonly occur in people who are over 65. Most cataracts are caused by years of UV exposure. A cataract causes blurred vision or glare, especially at night. They are treated with glasses, contact lenses, or surgery. 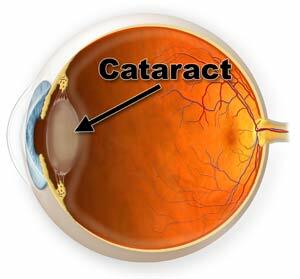 A cataract is simply a clouding of the lens inside the eye. 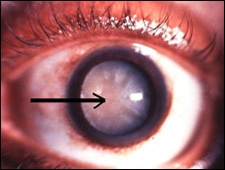 There are several causes of cataracts. Most are caused by years of UV exposure from the sun. Everyone will eventually get a cataract. 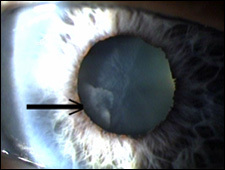 A cataract is not, as many people believe, a "skin" growing over the eye. 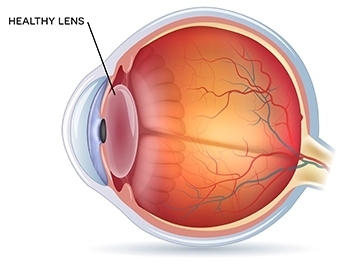 The affected lens is on the inside of the eye located behind the pupil which normally appears as a small, black hole in the center of the colored part of the eye. Normally, the lens is transparent and clear. But, because of age, disease, injury, or a birth defect, the lens becomes cloudy or yellow and loses its transparency. It becomes translucent. Light rays are scattered as they pass through, causing blurred vision and glare. Although there are many more kinds of cataracts than which are listed above, the most common form of cataract is the type that occurs in the elderly. Its cause is due to years of exposure to ultraviolet rays. It usually occurs in both eyes although not always at the same time. Cataracts may develop very slowly and never impair vision to the point where surgery is needed, or they may progress rapidly. Even though it is evident that the members of certain families seem to be more prone to cataract formation, the commonly held belief by most eye doctors is that senile cataracts are not a congenital or inherited problem. Actually, almost every person who is approximately 65 years of age will show some opacity in the lens. However, these irregularities may not seriously interfere with sight. Some lens opacities tend to become worse as time passes. There is no known medical treatment to prevent this progression. When a sharp object like a pin, needle, knife, or scissors point accidentally penetrates the lens, the injury can cause a cataract. Such penetrating injuries are especially common in children and industrial workers. Flying particles of metal may perforate the eye and injure the lens, causing a cataract. Protective safety lenses should always be worn, regardless of age, whenever anyone is in danger of being struck by such particles. Cataracts can also be caused or aggravated by diabetes and other diseases. Infants can be born with cataracts. Heredity can be the cause, or this condition can develop if, during the first three months of pregnancy, the mother experiences a problem such as rubella (German measles) infection. At Skowron Eye Care, we have the technology to actually photograph and/or videotape YOUR cataract. We review your case together to determine what the best possible course of action should be. Sometimes having cataract surgery WOULD NOT improve vision. We have the technology that enables us to ensure you surgical success. 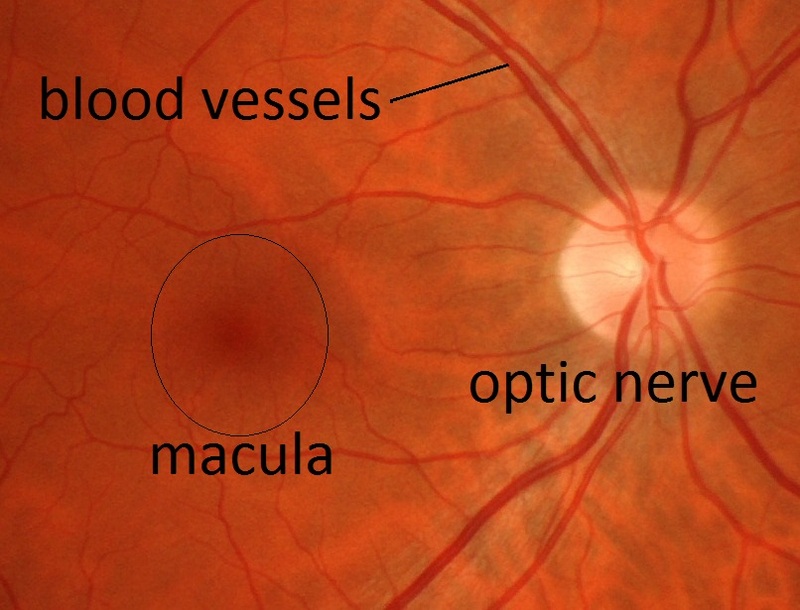 of the eye (retina) of a healthy eye. 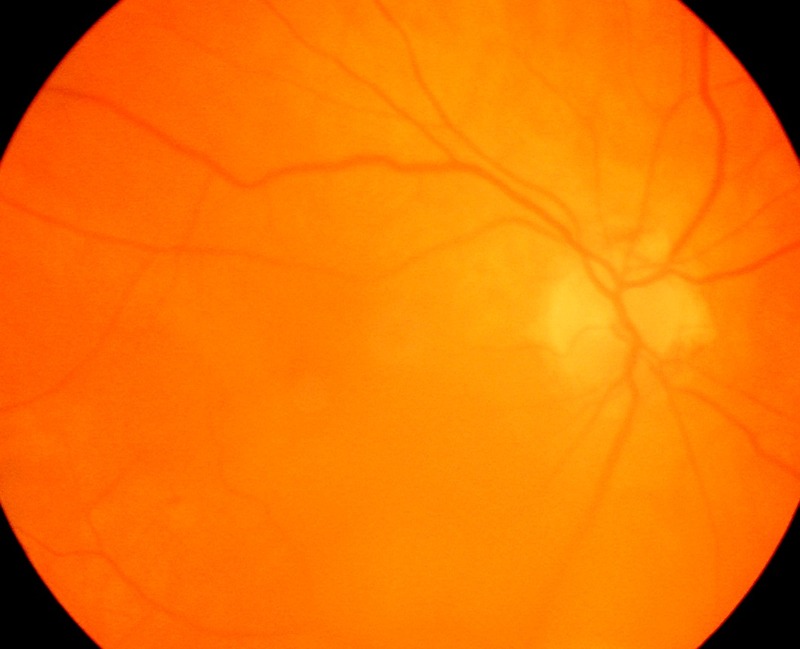 Doctor's view of a cataract eye. Structures are difficult to see. Baseline Photography has helped us detect cataracts in their earliest stages. Photography is just one of several tests we perform to diagnose and monitor cataracts. Surgery is fully explained in the office with a video presentation. CUSTOM LENS IMPLANT OPTIONS: are designed for your case are discussed at the time of your evaluation. We refer you to the most skilled surgeon for your particular type of cataract and implant option. We perform all of the post-operative care, so we only work with those surgeons who produce the best results. Surgery is outpatient, no-stitch, painless. Vision usually improves within a day or two. To minimize healing time, weekly follow-up visits are scheduled at our office. Surgery on the other eye (if needed) is performed 2-3 weeks later, both eyes are never done at the same time. normally black pupil is cloudy and milky. cloudiness between 7 and 9 o'clock. Toric Lens Implant: (Additional out of pocket fee). This implant will correct for astigmatism, allowing the patient the opportunity to see 20/20 at distance without glasses. Bifocal Lens Implant: (Additional out of pocket fee). There are several types of Bifocal (multifocal) implants incorporating different technologies that will allow the patient to see both distances and read without the need for glasses. These need to be discussed in great detail as there is often a several month periods of adjustment. 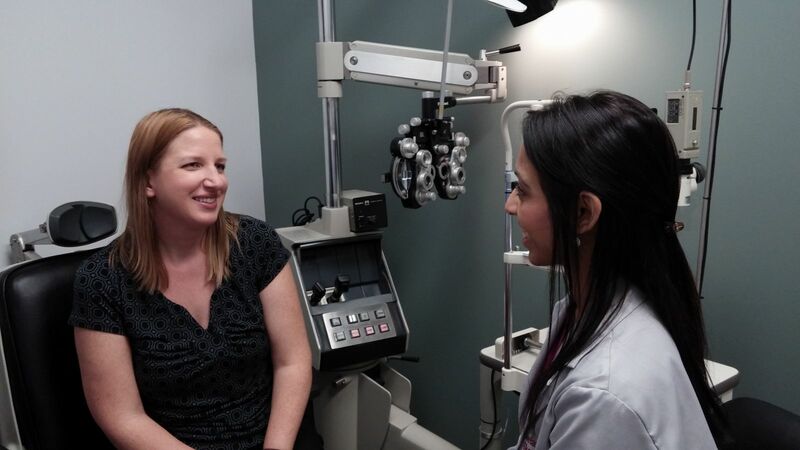 During this adjustment, some patients may feel their vision isn't as clear as they had hoped, or they see halos or glare at night. Some patients don't experience any adjustment period. These implants can be removed if one can not adapt, and a standard implant can be inserted. However, one needs to take caution and not take lightly, as the second surgery is more complex and complicated than the initial surgery. 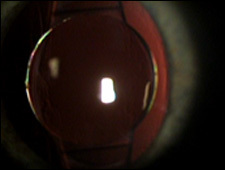 A lens implant as viewed through a dilated eye. In the removal of Cataracts, pre and post-operative care are essential for a successful outcome. At Skowron Eye Care, we oversee ALL your preoperative and postoperative evaluations. When an early cataract appears, its progress will be carefully watched. Surgery is usually not advised until the cataract begins to affect one's lifestyle. Intensified eye research in recent years has led to a number of new techniques for cataract removal. It is now a suture-less procedure, done on an outpatient basis. There is ONLY local anesthesia. The surgery takes between 10-15 minutes. There is essentially no pain. You are only restricted from swimming, heavy exercise, or bending over for about a week. Together with your examination, we will decide if surgery is the right treatment for you. We will determine which type of cataract implant will best suit your lifestyle. your needs and your desires. We will discuss at great length what possible outcomes you can expect. Implants can be custom designed to enable you to see clearly without glasses for distance vision or close vision. In some specific cases, you may not need to wear glasses at all! We will make sure you are totally informed before any surgery is performed. We work with only the best surgeons who have consistently provided excellent results. Only an eye surgeon can remove a cataract and insert the appropriate implant (per our recommendations). Whether glasses are needed following the operation is NOT a measure of the success of cataract surgery. TV makes cataracts worse: FALSE. Reading, knitting, doing other close activities make cataracts worse: FALSE. First-time cataracts can be removed with lasers: FALSE, THEY NEED TO BE SURGICALLY REMOVED. Cataracts cannot be removed using laser beams. Lasers are used only to treat a clouded membrane that sometimes forms in the eye after the initial cataract surgery (Click here for information about secondary cataracts). This can form only once between 3 months and 3 years and is removed in the office with a laser. The procedure is painless and takes about 7 minutes. Ointments, pills, and drops can cure or treat cataracts: FALSE. Graphic illustration and photo of the patient at SEC with secondary cataract treated with an in-office 5-7 min yag laser application.